With dynamic text to bring to life the story of God's love, this Large Print NLT is suitable for every kind of reader. 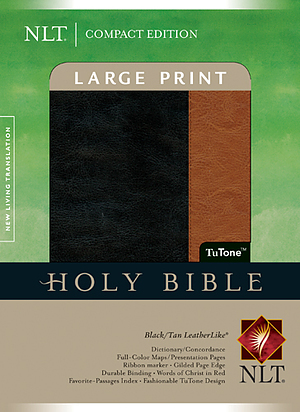 NLT Large Print, Compact Bible: Black Tan Tu Tone Leatherlike by New Living Trans 2 was published by Tyndale House Publishers in July 2007 and is our 11112th best seller. The ISBN for NLT Large Print, Compact Bible: Black Tan Tu Tone Leatherlike is 9781414312576. Be the first to review NLT Large Print, Compact Bible: Black Tan Tu Tone Leatherlike! Got a question? No problem! Just click here to ask us about NLT Large Print, Compact Bible: Black Tan Tu Tone Leatherlike.